When I was younger, I was a very picky eater. My parents were not okay with this. They wanted to expose me to a variety of foods and to try everything. I remember a couple of nights where my dad would tell me that I could just go hungry if I didn't want to eat what was for dinner. I probably threw a temper tantrum but would inevitably eat dinner because I was hungry. "Ready to tackle a classic dish from another culture? Pick an ethnic classic that is outside your comfort zone or are not as familiar with. You should include how you arrived at this decision in your post. Do your research then try to pull off successfully creating this challenge. Try to keep the dish as authentic as the real deal, and document your experience through a compelling post." I am always ready to learn about new cuisines! This was right up my alley! At first I thought I would learn how to make a traditional Hungarian dish since my dad's family is from Hungary and I have never learned how to make any of the dishes he made me. This would be out of my comfort zone but there were three other challenges I faced when selecting my dish. One, I am familiar with Hungarian food. In my mind this challenge was asking me to find a classic dish from a culture that I don't know very well. The second constraint was that I am partaking in the Physicians Committee for Responsible Medicine 21-day vegan challenge which means the dish I would be making would need to be vegan. The third constraint was that I would be at a debate tournament all day Friday, Saturday, and Sunday so I would have limited prep and shopping time late in the evenings and early in the mornings. A number of students I work with are from southern states in India and I knew a couple of them were vegan, so I asked for a restaurant recommendation for lunch on Friday to explore the cuisines of this part of India. My assistant debate coach and I ended up at Madura, a vegetarian restaurant with a number of vegan options. We ordered a variety of items on the menu to try and when I broke out my camera, that's when the education started. The owner of the restaurant asked what I was taking pictures for and I explained the Project Food Blog challenge. He was especially nice to us upon learning this and explained to me how each dish was prepared and what ingredients were in every dish. I will definitely be going back to Madura to enjoy more of the dishes that were lighter than Indian dishes I was more familiar with from other regions of the country. Every dish I tried was full of flavor and would have been fun to make, but keeping in mind that Uncovering Food is about exploring healthier options, I opted to make Uthappam, a pancake that is eaten for breakfasts and lunches and is embedded with a variety of vegetables and spices. What I failed to learn at the restaurant was how much time goes into preparing the batter. The first step takes 6 to 12 hours, then after a few prep steps you have another 12-48 hours of fermentation before the cooking of the batter. Which meant I would need to buy ingredients on Friday night after the tournament and cook the Uthappam on Sunday morning before leaving for the 8 a.m. tournament. I also hadn't anticipated that one of the primary ingredients would be difficult to find at a traditional American grocery store. When I was told the dish contained lentils, I wrongly assumed they were the ones I was familiar with. However, Uthappam utilizes Urad Dal which is much smaller than lentils most Americans are familiar with. This is a real penny. Split Urad Dal is very small! Be careful to not confuse it with larger lentil varieties. Luckily, after a harrowing search by fellow coaches and students I found a kit for another Indian dish at Whole Foods that had a bag of plain urad dal in it, so I was saved with only seven minutes before the store closed. I took my ingredients back to the tournament, which hadn't ended, and anxiously waited for the rounds to finish. The recipe I ended up making came about from both my conversations at Madura but also with parents at the debate tournament. I learned that many people now buy the flour pre-made for Uthappam but the best are always made from scratch. It reminded me of the difference between Bisquick and homemade hot cakes. However, I never got exact measurements and after doing some online research, I realized there is no exact formula. The ratios of rice to urad dal are between 2:1 and 3:1 and sometimes have the addition of cooked rice and/or flattened rice in the batter. While I would have probably soaked my rice and urad dal a bit longer because it supposedly heightens the flavor of the Uthappam, this recipe got rave reviews from the students and coaches who tried it on National Pancake Day (how appropriate to prepare these Indian pancakes on a day that celebrates it's American cousin!). Uthappam is a thick hearty pancake that can be topped with a variety of vegetables, fresh herbs, and spices. Rinse rice and urad dal in separate containers and soak for eight to twelve hours. Drain and grind rice while reserving the liquid. Drain and grind urad dal while reserving the liquid. Mix rice powder, urad dal powder, and salt together. Add small amounts of each liquid until you reach a thick but spreadable consistency. This will vary depending on how long you soaked the rice and urad dal, but I added about a half cup of liquid. You will want the batter to look almost like a thick pancake batter that can be poured but is thick enough for the toppings to stick to. Cover the batter and let sit in a warm place to ferment for 12 to 48 hours. Warm a large frying pan or griddle to a medium-high heat. I found in my research that the Uthappam is often cooked on a Tawa or Tava which can reduce the amount of oil needed because of the concave shape of the pan/griddle. Pour the desired amount of batter on the griddle and spread to a thickness of about a quarter to half inch. Sprinkle tomato, onion, and coriander on the uncooked side. You can choose to drizzle oil over the top of the Uthappam or around the edges. Once the bottom is browned, flip over and let the toppings-side cook for about ten seconds. You want the batter to brown lightly to secure the toppings without burning the toppings. Remove from pan and serve with a tomato chutney or Sambar, a lentil soup that usually contains tamarind, toor dal (yellow lentils), and a blend of spices commonly known as sambar curry powder. Recipe makes 8 Uthappam approximately six-inches in diameter. Nutritional information does not include the optional oil. One tomato-onion-coriander Uthappam has 258 calories, .69 grams of fat, 9.14 grams of fiber, 8.68 grams of protein. These are so interesting! I love that you utilized your students and their parents as a source of research on the dish before setting out to cook. Great job! Wow. You're awesome, for making do with all the restrictions you were under. Your persistence alone deserves a trophy, but the uthappam looks amazing, too! I do love savory pancakes! What a fantastic experiment! I've been exploring Indian food lately as well, but haven't challenges myself with anything that takes nearly as much prep time. Good luck! WOW - those pics pulled me right in, how gorgeous. What an adventure, too. I'm glad you made them, so I'd know how :D Great post! You weren't a picky eater when very young - your favorite food at age two was ducks feet (dim sum style). It was only as you grew older (age four or five I believe) that you became picky. Love your blog and your passion for food. We should have sent YOU to culinary school (had we known). i love south indian food! this looks great! Loved your comment on my 2nd PFB post! It's meant to be a fun(ny) food adventure! I loved reading about these vegan pancakes. I cook vegan food often, and it can definitely be a challenge! You've got my vote! Wow, your dedication behind this is awesome! I totally understand that running around feeling - I was doing the same thing. I can relate to you on that! Thanks for your encouragement that I almost gave up on sending an entry. It took me days to look for that special African flour. Plus the fermentation process of the batter. I'm glad to find a fellow foodie with a "breath of fresh air". You got my vote, and Im your newest follower too! Goodluck to all of us! Gorgeous gorgeous uttaphams. 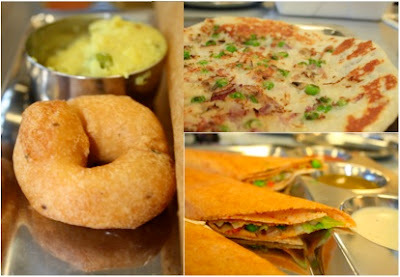 I actually like them more than dosas because they're denser, more pancake-like. Our favorite South Indian restaurant is Udupi Palace. Have you been? Nancy - the time thing would normally have made me reconsider but I committed to it and was going to see it through! Thank you Amy and Dan! Jax x - We should go to lunch in SF someday! Mhel - I was considering Ethiopian but I had eaten it before and never eaten southern Indian food but I am happy you were able to make it and submit it!!! Jun - Yes! One pancake was super filling and made a portable breakfast at the debate tournament! I have never been to Uqupi Palace (I had never eaten southern Indian fare before this weekend!). We should grab Jax x and go out sometime! I really enjoy Indian food but have yet to attempt to make it at home. Great job with stepping outside your comfort zone! Yum! I love uthappam. Thanks for sharing your experience with making it for the first time! Indian breads look simple on the face of them. But boy, they do take some time and technique. Bravo to you for creating such lovely ones, too! Loved your post! Full of humour, very personal and informative. Good luck! It's beautiful, and go you for tackling a real challenge!! Voted for you! My own entry is a traditional Indian dessert, Gulab Jamun -- soaked in rosewater, cardamom, and saffron syrup, as well as lots of special memories. Thank you for finding a vegetarian/vegan dish to authentically recreate rather than adapting a non-vegan dish (thus making it less authentic). And it's definitely a unique choice that looks tasty (even to a non-vegan eater). Great post and good luck in round 2! I'm glad you got this post off in time! Sounds like you had just as busy of a weekend as I did! Great job and good luck! This is the first time i run into this type of food, but i looks really good. I certainly wouldn't mind trying some.